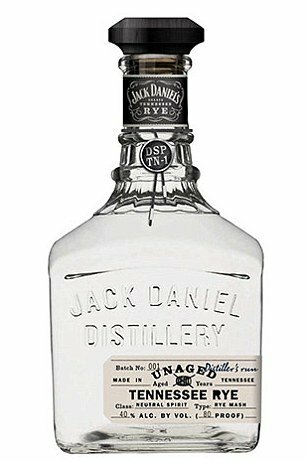 Jack Daniel’s distillery has unveiled a colorless unaged rye whiskey for the first time since the Prohibition Era, which will hit stores across the U.S. early next year. According to Uncrate, the white liquor has “a sweet and fruity smell, plenty of rye bite, and a crisp, dry finish”. It contains a combination of 70% rye – 19% above the legal minimum for a rye whiskey –18% corn and 12% malted barley. Jeff Arnett of Lynchburg, Tennessee, who is the seventh master distiller in Jack Daniel’s 146-year history, said that the formula provides a “new and unique tasting experience”. The color of whiskey is a result of the maturation process and can often give a clue as to the type of cask – sherry or bourbon – used to age it. The addition of legal spirit caramel is also sometimes used to darken the alcohol. Jack Daniel’s has hinted that it has also been experimenting with an aged rye expression, but as yet, there are no plans to go to market. Jeff Arnett added: “We’ve produced just a little bit to experiment around and let some mature in case should this be a long term offering. Jack Daniel’s Unaged Tennessee Rye will be available from January at selected stores across the U.S. in 750 ml bottles, priced at $49.99.